Who owns the voting machines, owns the election. Does this ever really happen? On a crowded sidewalk, a thief snatches a woman's purse and dashes away. "He stole my purse!" the woman cries, and some hero takes off in pursuit, tackles the would-be villain, and rescues the purse to the applause of onlookers who, despite not helping, are pleased the woman got her purse back. We've seen it so often in movies and TV that most of us think we've actually witnessed such a thing. But, as ex-Eagle Don Henley pointed out in his song "Gimme What You Got,"
Than any man with a gun. To the thieves we really have to worry about, purses are small change compared to their real goals: Ownership of the world. And since, as we've seen, those who would steal a world are sociopaths who mask their activities with Big Lies, instead of trying to run them down we must learn to look for evidence of their lies. And the most glaring evidence? The suppression of that evidence. Folks, here's a real simple rule and there are no exceptions. Anyone who says "Pay no attention to the man behind the curtain" is lying—and the truth probably hides behind that curtain. If your kid walked into the kitchen and said, "There's no need for you to check my room," what would you immediately do? If your spouse came home from shopping and said, "You don't need to look in the trunk of the car," what would you immediately do? Well, then—why, when President Bush said, "There's no need to investigate the World Trade Center attacks," did we, through Congress, agree to a non-investigatory analysis by his cronies? When he scolded about the foolishness of pursuing "malicious lies and outrageous conspiracy theories" after the FBI had already told us the attacks were performed by a conspiracy, why did we glare with him at the lack of patriotism of those who demanded to know the extent of that conspiracy? If we're finally going to start demanding investigations, why not start with the odd situation that put Bush in the White House to begin with—the 2004 election? Now, whenever I bring up this topic, I brace myself for the knee-jerk response: "Bush won and you lost. Get over it!" The problem is, Bush didn't win and we lost. Twice! And if we don't identify and solve the problem, it'll happen again. Forget the hanging chads and butterfly ballots. The Presidential election drama of 2000 is still a mystery to most Americans. Counting on Democracy investigates charges of disenfranchisement and 180,000 uncounted Florida votes cast largely by the working poor and people of color, uncovering racial exclusion, voting rights violations and the subverting of a recount in the most contested and controversial election in U.S. history. 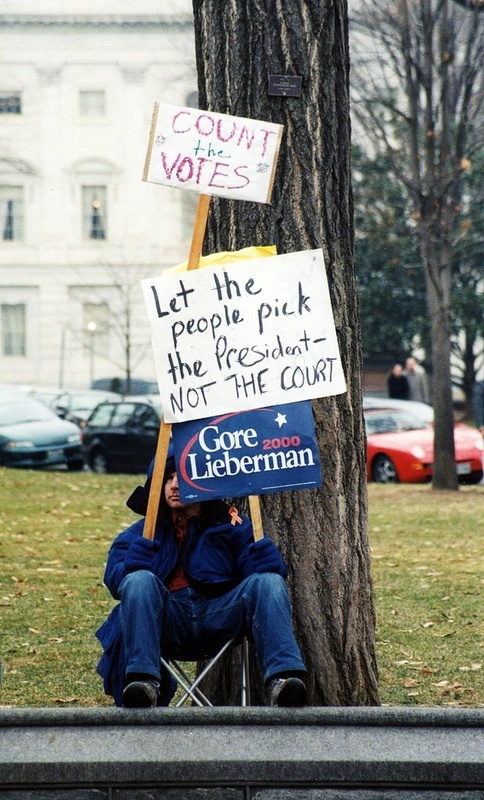 Of course, the "hanging chads" are all people remember of the 2000 election issues. They don't realize that these "chads" were part of a larger scheme, one which would keep the neocons in power forever: Voting machines that don't need voters. 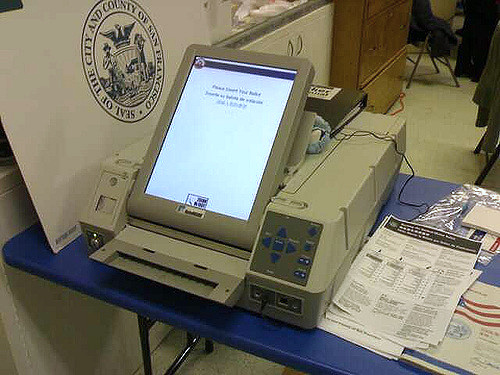 By the time 2004 rolled around a new system was ready and in place in many states: The "paperless" voting machine, basically a heavy-duty PC with a touch-sensitive screen. Those of us who were paying attention noted that most of these machines were manufactured by Diebold, the same company that makes most of the ATMs we use. So the company had a good reputation. The odd thing was that the CEO of Diebold, Walden O'Dell, said in a fund-raising letter to Republicans that he was "committed to helping Ohio deliver its electoral votes to the president next year." Now, what could this possibly mean? Just that O'Dell intended to campaign for Bush? Or did it have anything to do with the fact that Diebold paperless voting machines were, even then, boxed and ready for shipping to critical swing-state Ohio? The first clue that something was amiss was the exit polls. These have been controversial since the 1950s when TV networks first started polling voters as they left the polling place. The question was simple: "Who did you vote for?" And, while a few people were reluctant to share this information, most didn't mind. The exit polls proved to be astoundingly accurate—so accurate, in fact, that there were complaints that they actually influenced votes: People on the West coast, knowing who was ahead on the East coast, might just vote for the winning ticket. Nevertheless, exit polls have been so reliable that they are used to detect election fraud. Jimmy Carter used them, in fact, as an indication that there had been election fraud in Venezuela—which was subsequently proven. In the 2004 election, there were only two states in which the exit polls were markedly different than the voting results. One was Ohio, and the other was Florida. Getting these two states gave George W. Bush the election. Bev Harris, the woman who started www.blackboxvoting.org from her living room, demonstrated on live TV how the tabulating computers could be tampered with, throwing an election to the candidate of one's choice in less than 90 seconds, and leaving no trace! But things were even more bizarre in Ohio, where the Diebold machines reported more votes than there were registered voters! According to the Middletown Journal, at least 225 votes were registered for the fire levy in precincts with only 148 registered voters. Many Americans show up at a Presidential election to vote for a President—but no one else. For example, in Butler County, Ohio, according to the exit polls and the counts, 40,000 more Republicans voted for President than voted for the Republican candidate for county judge. This is pretty typical. However, according to the counts—but not the exit polls—almost every Democrat voted for both their judge and the Kerry-Edwards ticket. This might be the kind of factoid that only a statistics major would appreciate, but take it from me, statistics majors find it very significant. In Precinct lB of Gahanna, in Franklin County, the Diebold voting machine recorded a total of 4,258 votes for Bush and 260 votes for Kerry. In that precinct, however, there are only 800 registered voters, of whom 638 showed up. We've been told by the media that, by and large, only wacko "conspiracy theorists" believe the 2004 election was rigged. Yet, in real life, there was no shortage of demonstrations afterwards, as a stunned, pro-Kerry populace began to realize that no one they asked had voted for Bush—yet Bush had, somehow, won. There are enough clues apparent to conclude that something was very squirrelly about the 2004 elections, and that something is connected with Diebold and its voting machines. Mayer Amschel Bauer, founder of the Rothschild banking family, once said, "Give me control of a nation's money and I care not who makes the laws." Now it looks like a more appropriate sentiment would be, "Give me control of a nation's voting machines and I'll make my own damn laws." The only question that remains is, who will tackle the thief before he escapes with our democracy?